Apache OpenOffice is a free and open source suite of productivity tools that assist companies, businesses, and professionals in managing their writing projects, streamlining their document management tasks, and collecting and manipulating valuable data efficiently. The complete office package is easy to use and the tools that comprise it work seamlessly, consistently, and harmoniously with each other. Apache OpenOffice enables users to easily determine the application or tool used for creating a particular file. They can also open the file from anywhere and launch the application that created it instantly. Furthermore, Apache OpenOffice makes it easy for users to transfer data and information between its tools. The tools also share a common spell checker that has options which they can update and synchronize across all the tools. It has a word processing application that helps users concentrate on writing their ideas while having the opportunity to make their content and documents look great. Apache OpenOffice provides a spreadsheet application that has the capability to pull in data from various sources. The productivity suite offers an outstanding tool which can be used for creating multimedia presentations. Equipped with drawing and diagramming features, special effects, and animations; this tool is beneficial for producing impressive materials. With its drawing application, Apache OpenOffice makes the sketching of business processes and creation of diagrams a breeze. In addition, the suite delivers a database management system which can track personal files and enables users to access the data they need for preparing reports and other documents. Last but not least, Apache OpenOffice is equipped with a tool used for creating and editing mathematical equations and formulas for text documents. As they type words and phrases, the application can suggest common words and phrases and can automatically complete what they are typing. When they type a misspelled word, the tool immediately identifies and fixes it. The word processing application can generate tables of contents, biographical references, tables, illustrations, and other objects. This makes it much easier for readers to consume and digest long and complex documents. Writer has powerful exporting features which permit users to export their documents in HTML, PDF, or MediaWiki file formats. Because of this, their documents will become readily accessible and available for others. Through the aid of its tool called Calc, Apache OpenOffice helps users manage spreadsheets. Calc is an easy-to-learn spreadsheet application that data miners and number crunchers will find very useful. This tool utilizes an advanced technology which can pull in raw data from multiple corporate databases. Once it collects the data from the databases; it cross-tabulates, summarizes, and converts such data into meaningful pieces of information. Calc also allows users to generate formulas through natural language. This means they will be able to come up with formulas by using simple words. The spreadsheet application lets them analyze numbers and other data through the aid of its feature known as Scenario Manager. This feature enables users to create what-if scenarios and conditions so they can gain better insights into their data. Here, they can make different levels of sales forecasts and compare their profits based on those forecasts. Additionally, Calc offers a collaboration feature which allows team members to share spreadsheets with each other and integrate new data into spreadsheets. Apache OpenOffice ensures that users are able to produce impressive and effective multimedia presentations. The office suite has dedicated a tool for creating presentation materials and enhancing them with 2D and 3D clip arts, special effects, and animations. Named as Impress, this application is also equipped with drawing and diagramming tools which can be organized in a single screen, allowing users to easily access the drawing tools they love. Additionally, Impress lets presenters access different views of their presentation materials. Thus, they can present them as slides, outlines, notes, or handouts; depending on their own needs or what suits their audience. Built for creating technical or general posters, Draw is among the powerful tools available in Apache OpenOffice. With this tool, sketches of business processes, plans, and diagrams can be done effortlessly. Draw allows users to manipulate objects within their drawings or diagrams. For instance, they will be able to rotate objects in two or three dimensions. Also, the tool is built with a 3D controller feature which permits them to come up with shapes, cubes, rings, and more. Through the aid of its smart connectors, the application enables them to rapidly generate flowcharts, organizational charts, and network diagrams. Apache OpenOffice provides a fully featured desktop database management system which allows users to store data and information and access them quickly. It has an HSQL relational database engine which is designed for personal use. With such engine, users can track their personal assets such as CD collections. The system also supports multi-user database engines which include MySQL, Adabas D, MS Access and PostgreSQL. Interestingly, it integrates with the other tools in Apache OpenOffice. As an example, users can pull in data from their address book when they are doing a mail merge using Write or generate link data ranges in Calc as they conduct data pilot analysis. Lastly, the productivity suite is equipped with a tool called Math which is used for creating mathematical equations and formulas. Whatever equation they form, they can insert it into any Apache OpenOffice application. Thus, they will be able to add equations to their text documents and other types of documents. They can also easily edit their equations using the tool. If you are interested in Apache OpenOffice it could also be sensible to check out other subcategories of Best Office Software listed in our database of SaaS software reviews. Companies have unique wants and requirements and no software application can be perfect in such a situation. It is futile to try to find a perfect out-of-the-box software app that meets all your business requirements. The smart thing to do would be to modify the solution for your specific needs, staff member skill levels, finances, and other factors. For these reasons, do not hasten and invest in well-publicized leading applications. Though these may be widely used, they may not be the ideal fit for your specific needs. Do your research, investigate each short-listed platform in detail, read a few Apache OpenOffice reviews, contact the seller for clarifications, and finally settle for the product that offers what you require. How Much Does Apache OpenOffice Cost? Apache OpenOffice offers no enterprise pricing plans. You can use all of its productivity tools for free. We realize that when you make a decision to buy Office Software it’s important not only to see how experts evaluate it in their reviews, but also to find out if the real people and companies that buy it are actually satisfied with the product. That’s why we’ve created our behavior-based Customer Satisfaction Algorithm™ that gathers customer reviews, comments and Apache OpenOffice reviews across a wide range of social media sites. The data is then presented in an easy to digest form showing how many people had positive and negative experience with Apache OpenOffice. With that information at hand you should be equipped to make an informed buying decision that you won’t regret. What are Apache OpenOffice pricing details? 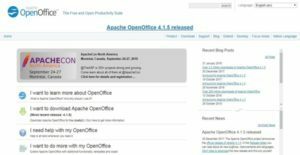 What integrations are available for Apache OpenOffice? If you need more information about Apache OpenOffice or you simply have a question let us know what you need and we’ll forward your request directly to the vendor.